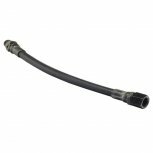 Home > Paintball Air Tanks>Air Accessories>Spyder EMR1/MR1 Braided Hose 7.75"
Spyder EMR1/MR1 Braided Hose 7.75"
A replacement 7.75"" braided line for your paintball gun. Braided lines have the advantage of being extremely durable while maintaining a light weight easy to install design. This means you are going to have an easier time getting back on the field and staying there.